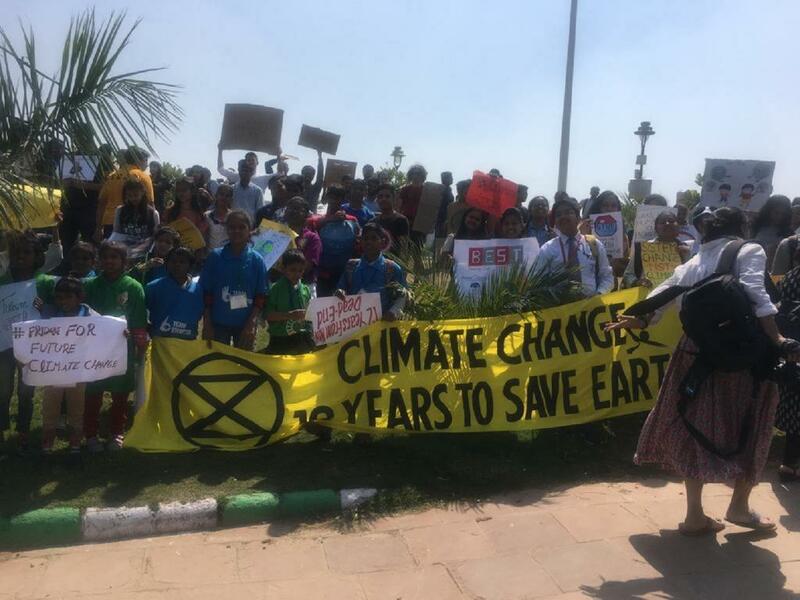 Following tens of thousands of youth in 123 countries around the world as part of the #FridaysForFuture movement, India saw some of its first school strikes against climate change. Inspired by 16-year-old Swedish student, climate activist, and now Nobel Prize nominee, Greta Thunberg, who protests every Friday outside the Swedish Parliament to urge leaders to fight climate change — hundreds of students walked out of schools across multiple cities in India demanding the government to take action. 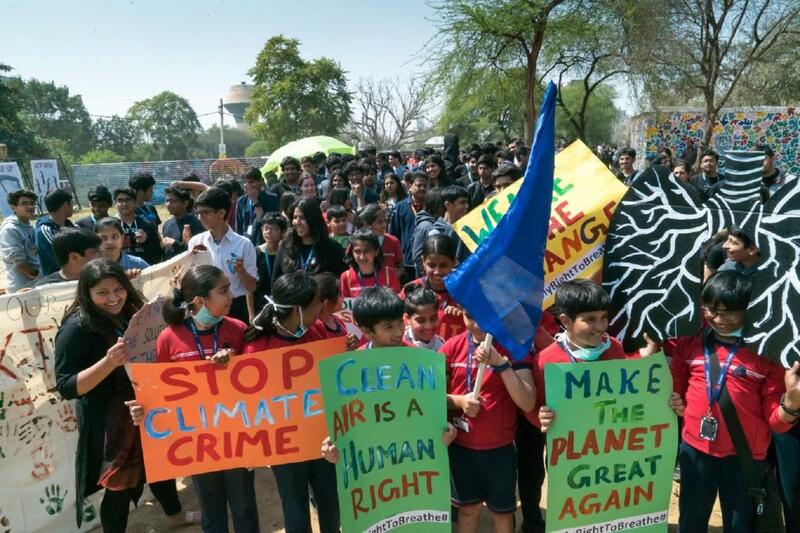 Around 200 students skipped school in Delhi-NCR (many of whom were students from impoverished backgrounds), emphatically demanding that the government reduce carbon emissions before it’s too late. Many of the youth gathered there joined the protest on their own volition, having taken permission from teachers. There were also others who were, in fact, encouraged by their own teachers and schools to take part in the strike. Having seen the adults repeatedly fail in curbing pollution levels and the Indian government, time and again, seeking to cut down the lungs of the city in the name of ‘development’, the youth decided that it was high time to call for substantial action. The World Health Organization estimates that around 93 per cent of the world’s children below the age of 15 years breathe air that is so highly polluted that it puts their health and development at risk. In 2016, 600,000 children died from respiratory infections cause by polluted air. A 15-year-old student at the Delhi strike, Asees, complained about how she could not participate in her school’s basketball tournament due to hazardous pollution levels in the city. Prime Minister Narendra Modi may have won the United Nations’ Champion of the Earth award for his work on spearheading the International Solar Alliance, but that means nothing when trees are still felled for development, and fossil fuel emissions are continuing to rise at the cost of lives of people and children in India. With India’s future generations nearing their premature death knell, why is the government not taking the requisite measures needed to address the climate crisis? The oft used slogan during the strikes — “System change, not climate change” — is what comes to mind. The current capitalistic system nurtured by the Indian government (like many others) is fundamentally flawed, with goals of short sighted gains in power, profit and development taking precedence above all else, including human rights. India’s achievement of economic growth has been on the premise of inter-generational theft and the violation of the future generations’ right to life. Students at the strike echoed this idea, voicing their concerns on the destruction of their futures, the short-term profits made by the richest few at the cost of the environment and the impact on quality of life due to overconsumption. A stance that India has taken at international climate negotiations for decades is that it is not responsible for the historic greenhouse gas (GHG) emissions that are contributing to global warming and climate change as we see it today; and therefore uses this as an excuse to justify not having to create overall absolute emission reductions. However, India is in no way free from washing its hands off in taking ambitious climate action. The country’s emissions are rising exponentially, making it the third largest GHG emitter in the world. Employing this rhetoric is highly hypocritical when India’s current emissions will be responsible for the fate of its future children. Citing these reasons for averting action will not work any longer, especially when the youth become future voters. “Our political parties no longer have the freedom to ignore the fact that climate change is ruining us or ignore the fact that the youth of India today are awake, aware and politically active,” said one of the students. There is no time for India to spend time playing blame games, engaging in cautious climate action. India is one of the most vulnerable nations to climate change, with many of its effects already taking a significant toll on the country — so the Indian government must take the responsibility to act in line with keeping global warming under 1.5° Celsius. It is also a fitting time that these strikes have taken place, given the upcoming elections. The new Indian government must resolve to make fighting climate change its main priority. It will need to usher in new ideas, policies and ambitious measures that will also take into consideration the future of the country’s youth. “We are a country of young people … I call out to political parties today to focus on what is important to the youth – our existence and our planet…elections are just around the corner, and we will be watching,” said another student at the strike. The youth have shown their willingness to do what it takes to save the planet – now it’s time for the adults to start taking lessons from the kids and take ambitious climate action.